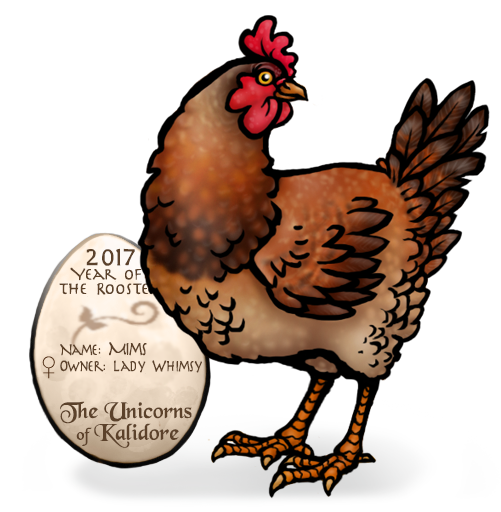 Besides unicorns, Kalidore is host to a myriad of different creatures, some of which have been captured in breedable adoptable of their own. On this page you will find everything you need to about those other creatures ~ enjoy! Weighing in at about 7oz, the smallest of the griffon family really does fit nicely in the pocket – if you can manage to keep one still that long. Intelligent, voracious, and having no concept of their small size (or other people’s personal space and/or belongings) they love being in the thick of things and are quite the steely opportunists; they are also highly food motivated, so one could consider them questionably trainable. Sporting an endless range of pattern and colour, these vocal, inquisitive creatures are right at home among Kalidore’s human population, if only because they view them as an excellent source of treats. Colloquially, a male pocket griffon is called a Pouncer, a female is called a Lady; griffons chicks are Ookpiks or grifflettes, generically. For in-depth information on Breeding Your Griffon, see the expanded page HERE. Cute, fluffy, and fits in your lap, the anagale is Kalidore’s answer to the bunny rabbit on all counts. While by nature shy, with careful tending they can be surprisingly sociable with familiar people, but do prefer to do things on their own terms and can get stressed in unfamiliar situations. They don’t travel well, and have particularly sensitive digestive systems. Please Note: Anagale are not currently breedable, pending inking and templating of the male and baby lines. We do not have an estimated delivery date. At home on the great grassy plains of Kalidore or in your vegetable garden, these miniature, dog-sized antelope are spunky and endearing. They tame very easily, practically becoming your own personal fan club, to the point that they can be somewhat of a nuisance (especially when they are literally underfoot). They are somewhat skittish, and when startled go bouncing off to safety (or to whomever/whatever end they deem the “safety” is in the situation); they are not terribly trainable either; blame this on their short attention span or general vapidity within the breed, but don’t expect them to ever get the concept that books are not for eating or your bed is strictly off-limits. Litter training is markedly out-of-the-question, too. Diki require only one item for breeding, a sprig of Merriberries. Diki have a 20% chance of twins with any breeding, with a 50/50 chance of male/female. (And I have it on good authority that feeding your diki oranges works to boost its fertility). The Cerewynne is a majestic beast, the largest of the Isle’s Cervidae and the major arcana of that genus; because of this Cerewynne are fully fluent in the Isle’s language, and above all, should never be considered as someone’s pet – much offence would be taken to such a notion! Best known for the males immense golden antlers and snow white coat, there is in fact some subtle variety in the colour of the coat and horns. The white coat is primarily the winter coat, but some Cerewynne may shed out darker in the summer months. However, truly different coat expressions or patterns are extremely rare. Cerewynne are quite rare and are only available during the Winter Festival. More items will be created in the future, including new decorative items. Muskmice ~ Native to the rocky Skyfields, these chinchilla-sized rodents are easily recognized by their often brilliantly-coloured splayed horns. They are generally shy, but can often be lured out with treats. They are not the most sociable pet, but can come to recognize their person and even learn a few tricks, too. Note: At this point in time, Muskmice are not breedable. It is believed that Skyree are native to Ellasia, the Elvin world, and a few snuck into Kalidore during the Lunar Festival. Not much in known about Skyree other than they sport various forms and mutations, including winged and unwinged examples of the type. Note: At this point the Skyree are not breedable, pending inking and templateing of the other stages. It’s really quite questionable just what goes on in that amphibian brain, whether they are capable of understanding the concept of pet or just relish the immediate gratification of being fed yummies and having a bathtub to swim in. So don’t expect to snuggle up with your urdvoggen (at least, not intentionally… they have been known to enjoy a warm bedroll or two) but trust that your pet will surely be an interesting conversation piece! 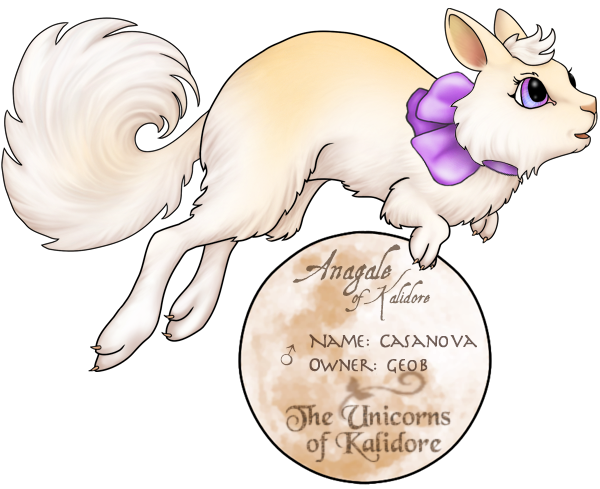 Note: At this point urdvoggen aren’t breedable; do you really want to breed an urdvoggen? The Lady of the Temple Library is very fond of birds, from the wild ones that visit her yard to the flock of motley chickens who keep the pests from the gardens. 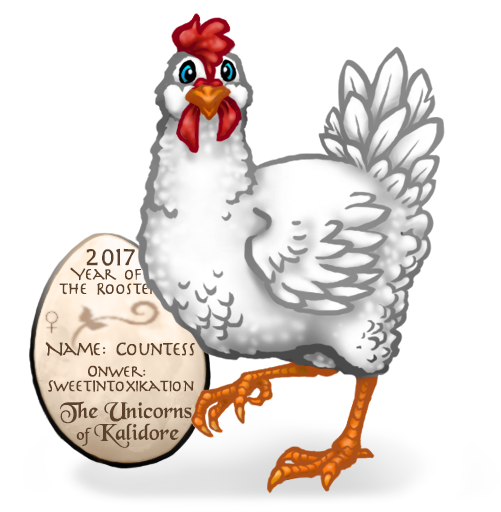 We celebrated the Year of the Rooster by bringing Rhaine’s “ladies” into fruition! 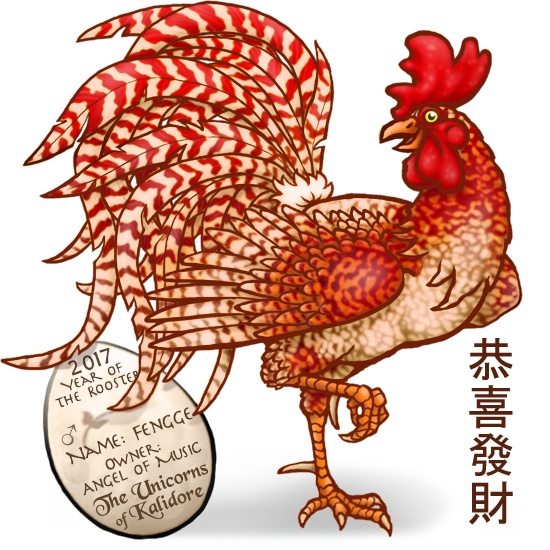 The Chickens of the Temple are much like thier earthen counterparts and come in a wide variety of natural colours — and a few unatural ones too (because, after all this is Kalidore!) They are generally quite friendly – especially when the visiting party is carrying food. Currently they are not breedable, pending the inking of the chicks. Because what’s cuter than fluffy baby chicks? 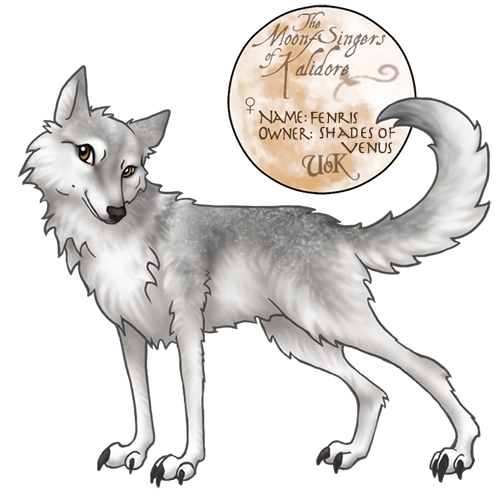 They go by many names – the Forest Wolves, Wolves the Kaledon, the Moon-Singers. They are referred to by the Unicorns as the Forest Sentinels, a duty the wolves take very seriously. They reside throughout the woodlands in tight-knit family groups, although they will band together in times of tribal need. 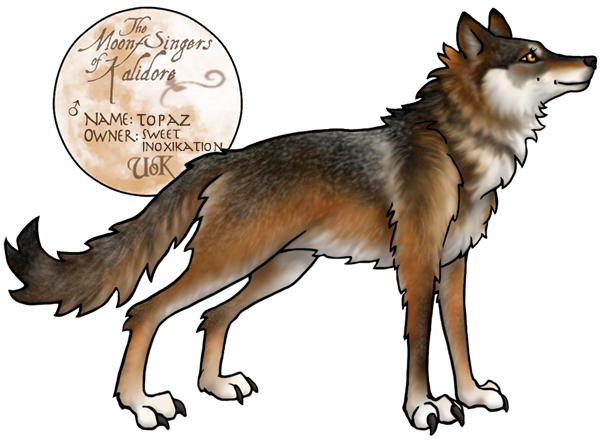 Tayo and Vora lead the largest tribe, and as such act as liaison between the wolves and other creatures of the isle. As a major Arcana, they are fluent in the Isle’s languages, but tend to keep to themselves. Nearly indistinguishable from the Grey Wolves of Earth’s Northern hemisphere, these wolves of course are not only grey, but range in colour from nearly black to nearly white, and many shades of earth brown in between. While their colours are natural-hued, they do show more variation than the earthen variety. The Wolves of Kaldiore have a rich storytelling history and their tales speak of two mythic beasts, Aiya (AY-ah) and Ag’anae (a-GAH-nay); they are fierce rivals who will one day destroy each other and the world will end. Yet they are also described as valued equals, consorts. These myths speak to the harsh reality of a predator’s existence, a tenuous balance, but also to the sublime understanding that everything – good and evil, life and death, all – are parts of one great whole. The Moon-Singers are not currently breedable, and though we intend to support this in the future, have no estimate when this will be completed. … hey, what am I doing on this page?